If your home’s plumbing has a problem this fall, you need to be able to communicate to the plumber what it is. Many different industries have their own specialized vocabulary to refer to people, tools, and techniques. Plumbing is no different. If your home’s plumbing has a problem this fall, you need to be able to communicate to the plumber what it is. Then they can start to figure out what has to be done next. Copper pipes are pretty self-explanatory. They are pipes or water lines made of copper, or sometimes, a copper alloy. Copper pipes are, for the most part, highly reliable. The pipes themselves won’t move much, but tubing will be easier to move around. Copper is also rust-resistant and last for years. The main probably is that they can start to corrode, and corrosion will cause leaks. That said, you can rely on your copper pipes for years and years, especially if you are worried about the quality of your drinking water. Drains are an important part of your plumbing system. These are openings that allow water to flow away or drain where it can be treated and potentially reused. Sinks, toilets, and tubs all have drains. While most of the time you’ll see an open drain, the drains on the floor (either in a tub or a shower stall) will have a protective grate on them that can trap hair and other debris, which can, in turn, cause a clog or blockage. The flapper is found inside your toilet. It can move, and as it opens and closes, it allows water flow. Without a functional flapper, your toilet won’t be able to flush properly. 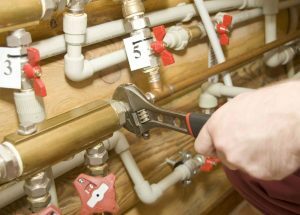 A master plumber is someone who has gained more than ten years of experience, especially after completing the apprentice and journeyman portions of their training. They need to pass state exams relating to the tools, codes, and practices that are part of the industry. The master plumber typically runs their own business and has to find clients and new jobs as the years go by. This entry was posted on Friday, October 26th, 2018 at 11:28 am. Both comments and pings are currently closed.